Is your motor doing a Bosanova during flight? Chances are your propeller needs to be re-balanced. Propellers suffer wear and tear that may cause them to go out of balance. Damaged propellers that are repaired, almost certainly will be out of balance. Incorrect Storage may cause imbalances to develop. Occassionally even a newly delivered propeller may be out of balance. You may do some modifications to your propellor that require re-balancing. There are two types of balancing of spinning objects, including propellers. Static Balancing - each blade to weigh the same, and CG to be at the same radius. Dynamic Balancing - even if static balanced, one may have its CG closer to one side of the disk (forward or backward) than the other blade. The thicker the spinning object is (along the axis of spin), and the greater its rotational energy, the more critical Dynamic Balancing becomes. Dynamic Balancing requires very sophisticated laboratory or workshop equipment. Crankshafts and flywheels MUST be very carefully and accurately balanced both static, and dynamically. Fortunately for us, propellers are relatively thin objects and spin at much lower RPM than than crankshafts, so we shall concentrate only on static balancing. All you need do on any average propeller, is to ensure that the entire propeller, with all its blades fitted, will not be heavier on one side than the other. If you removed your drive belt and allowed the prop-hub to rotate freely, there should be no tendency for the prop to rotate to one specific attitude each time. However, we need to be more accurate than this. I have two simple techniques for checking the balance of my propellers. The first is real straightforward and serves most purposes, the second a bit more accurate. The first and easiest to do, is to get a roller-bearing that fits snugly into your propeller's central hole. You can add a few turns of insulation tape evenly around a bearing that is slightly too small. Next, you need to find a long bolt that fits snuggly into the centre of this roller-bearing. Slide the bearing over the bolt until it stops against the bolt-head. Then fit a nut onto the bolt, and turn it until it comes up against the bearing hub, holding it in place against the bolt-head, but allowing the bearing to turn freely. 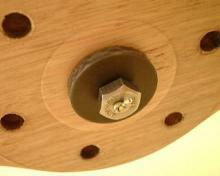 Now position the bolt in a table-vice, protruding out horizontally. Place the propeller carefully over the bearing, with one blade level. This blade's tip is the "Start Position". Let go and see if that blade tends to rise or fall. Rotate the blade until the next blade is in the start position and again note if it rises or falls. If more than two blades, continue with each. You will soon clearly see if one side is lighter than the other. 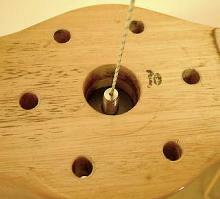 For the second and more accurate technique, you need to make a small balancing jig. Thanks to George Killey for teaching me this simple but very useful trick. Some stout mono-filament fishing line, about 1mm or thicker in diameter, a few feet long (to reach from your ceiling to about elbow level. A steel bolt, approximately 8mm diameter,about two inches in length (50mm)or a bit less. Very accurately, drill a hole through the centre of the bolt, along its entire length. It should exit at the very centre of the bolt-tip (the other end is not too critical). The diameter of this hole should closely match the line above, so that the line can be passed through the centre of the bolt with a knot at the head, and the line length protruding from the bolt-tip. There should be no lateral movement of the line in the hole, otherwise the line will not be in the very centre. A "plug" of nylon, wood or aluminium, turned in a lathe, that fits snugly into the central hole on your prop, usually 1 Inch diameter. It must have a round lip on one side, to prevent it from passing through the hole. It should protrude about an inch and a half into the prop centre. Now accurately drill and tap a hole in the very centre of this plug, to fit the bolt. Screw the bolt into the plug, from the side with the lip. Place the plug into your prop's central hole, until the lip is against the prop hub. The line protruding from the other side of the prop should be hung from your ceiling, so that the prop is hanging at a comfortable height. Now the bolt-head should be at the very bottom, pointing upward with the tip somewhere inside the prop and the line continuing upward toward your ceiling. How this system differs from the one above, is that the prop is now hanging with its hub in a horizontal plane, not vertically as on the bearing. You can now check the balance of a two blade prop not only along the line of the blades, but also side to side (or edge to edge). If you have more than two blades, you can instantly see which is the heavier. Furthermore, the sensitivity of the system can be adjusted by turning the bolt and adjusting how far it protrudes into the prop. The tip of the bolt is the fullcrum on which everything balances. If the tip is much higher than the propeller's centre of gravity (approx half its thickness), then the system is less sensitive and will only tilt slightly toward the heavier side. As you adjust the bolt-tip lower and closer to the CG, it will become more sensitive and indicate smaller imbalances. If you go too far, the fullcrum may be under the CG, and the prop will constantly roll-over in any direction. With this system, if you have a two blade propeller, you may find that not only is one blade heavier, but it may be heavier on one side (the blade points down, and is rolled over to one side). You need to remove materail on that side, or add weight on the other blade, on the lighter edge. You can either remove material from the heavier side or add material to the lighter side, whichever is more practical. Be careful not to change the overall shape and profile of the propeller. If slightly out of balance, simply apply a bit of paint to the lighter side until correctly balanced. Apply a very thin layer of paint evenly over a large surface, preferably the entire blade. Once the paint has dried, re-check the balance. Use similar paint (or varnish) to the original. If clear paint, you can use K2 type paints where you mix two parts, such as Glatex 8 or Duco equivalent K2 type. You can either brush the paint on carefully, or spray it on. Aerosol spray cans may be used, or a spray gun. I use a miniature air-brush designed for hobby work. These are designed to run off aerosol cans of pressurised air which are expensive on such large jobs, so I improvised. I attached an air-hose with a car tyre valve-clip taken from an old tyre pump. My spare wheel from my car is pumped to about 7 bar (100 PSI) and supplies enough air to completely paint one prop, or re-balance 2 or 3. Re-inflate the weel when it gets down to 1.5 BAR (22PSI). Apply a layer of paint, wait for it to dry completely, then re-check the balance and apply more paint if and where it is required. While checking for balance with either of the two systems, ensure there is no wind or drafts in your workshop to affect the prop. If you open a window to facilitate paint-drying, close it again when you re-check the balance. A well balanced propeller will run smoothly, with noticibly less vibration, hence less pilot stress and aircraft fatigue. It may not be possible to eliminate all vibration, especially on single-cylinder motors - it may not be the propeller vibrating. It may be your crankshaft, flywheel, magneto stator, a drive pulley, or the drive belt. All of these (except the belt), can be re-balanced by any motorcycle crankshaft-balancing workshop. They may even be able to dynamically balance your propeller, for extra smooth operation. If a wood propeller is stored in a vertical position for a long time, it WILL eventually go out of balance! This may happen while still fitted to your motor, so turn to propeller to the horizontal position if you leave it on the motor during long term storage. I am not sure if this is because the moisture in the wood (there is always a small amount) gravitates downward due to its weight, or if it rises due to capillary action, either way your fine prop loses its balance and starts doing a little Bosanova in flight. It is common to store a prop on a wall peg or long nail. Do this in the horizontal position, but rotate it 180 degrees every few weeks. The worst is to store a prop standing against a wall like a rifle, or hanging vertically in a propeller protective bag. The best is to have the prop lie flat on a level surface, such as a storage shelf.